Nomads retro 60s inspired embroidered longline top. In a vintage style Ivory white crinkle cotton fabric, this fab summer top is surprisingly substantial. Featured retro 70s style embroidery around the neck and collar, made using traditional artisan techniques and with 100% fair trade cotton. 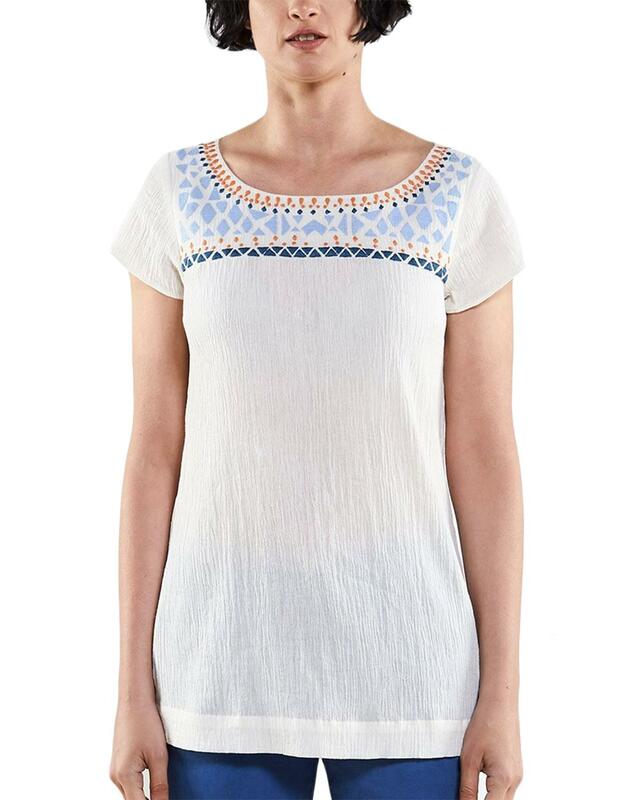 A flattering longer length makes this top ideal for many occasions. One to take on your holidays or for hot days, which is equally at home paired with the Nomads Handloom suit for a retro inspired summer workwear outfit. - Nomads womens long tunic style top in ivory. - Retro crinkle cotton top. - 100% fair trade cotton. - Orange and blue retro 60s Boho style embroidery to neck and chest.